Is it possible to fake such information and how? When I use for example Firefox, does Firefox serve these system information for the Flash plugin and then I can fake them with a Firefox addon which registers the call event of the Flash extension and returns wrong data? Or has the Flash plugin direct access to the operating system? If yes, can I build software which runs in the OS background and registers the Flash plugin call and then serves faked information? I know that NPAPI is the interface between the browser and the OS, but I have no idea if it is possible to manipulate the called information in any way and if such information (like installed fonts) are parameters stored in the browser or served by the OS. Step: the tracking tool starts to collect my fingerprint with flash, calls action script functions to get installed fonts etc. At 4. step i want to spoof system parameter. And the question is, if this is possible in general (with a Firefox extension or a OS native application) and how. And: from where does the Flash plugin get the system information? From Firefox parameter? Through the NPAPI interface from the system? You want to fake such information in order to evade browser fingerprinting done by some websites but you have to know that the simplest fingerprinting algorithm deployed today is able to detect, follow and even guess a fingerprint's changes. Also, you have no idea about the fingerprinting algorithm you want to foil. An other problem fired by your question is how to fake such information. Well, there is no solution that fits for all the cases. I mean depending on the information you want to fake different solutions and tools may exist or not. For example, I can mention you the Firfox User Agent Switcher which is an addon that performs what its name says. Can I get hardware and operating system information with Flash? You need to look to the Capabilities class and see what information it can get from your operating system and hardware. For instance, the cpuArchitecture property specifies the current CPU architecture. The cpuArchitecture property can return the following strings: "PowerPC", "x86", "SPARC", and "ARM". The server string is ARCH. while the os property specifies the current operating system. Note: This paragraph does respond to the question whether such data may be sent using a Flash web application over Internet or not. That will be discussed later on. 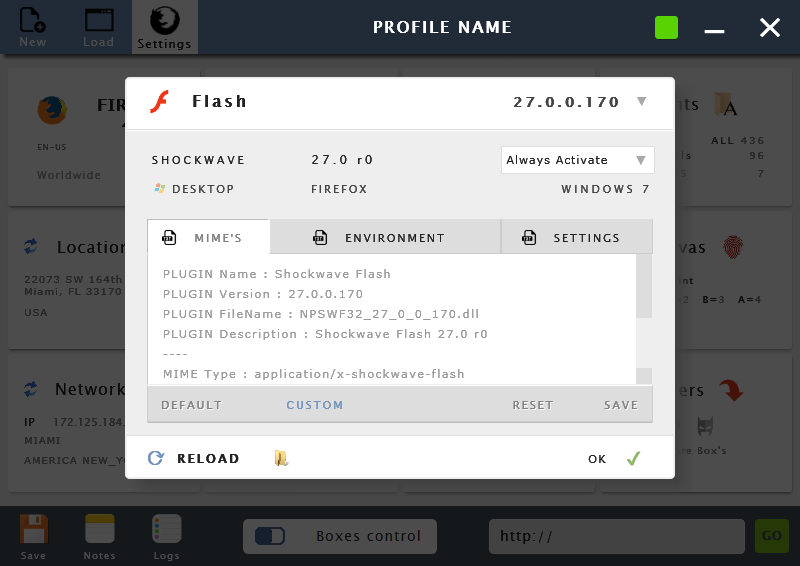 What is a Flash web application? What are local shared objects? The problem with running Flash web application (apart from the Flash vulnerabilities that you are not addressing here) resides in what we call local shared objects (LSOs) better known as Flash cookies. Flash cookies are relatively unknown (Schneier on Security: Flash Cookies). While an HTTP stores only around 4KB of data, a Flash cookie contains up to 100KB data (ActionScript3.0 Cookbook). You can even enhance the storage capacity of a Flash cookie at your will. A Flash cookie is not stored in a file within the browser space but in a separate Adobe file with a .sol file extension: this means the browser has no control over Flash cookies and when you clear your browser's cookies, Flash cookies are still there on your computer (but there are tools to delete them). Which content may be stored within a Flash cookie? For HTTP cookies where contents are determined by the specific website that created that cookie. Contents vary from site to site. This applies for Flash cookies. The Flash cookie is used generally to save user's settings (for example when you watch a video on Youtube and change the dimensions of the video screen: the dimensions are stored in the Flash cookie). What are the main privacy issues inherent to LSOs? Flash cookies contain the information that may be hold in an HTTP cookie and much more except the field related to expiration date: Flash cookies do not have an expiration date by default as it is the case with HTTP cookies (where the common practice of companies' websites set it usually set to 30 days); and one of the reasons for this is because when companies tracking users noticed that lot of users clear their cookies at least once per month lead to overestimate the number of true unique visitors to websites, and thus to the overpayment for advertising companies (The Impact of Cookie Deletion on the Accuracy of Site- Server and Ad-Server Metric s: An Empirical Comscore Study). Note that the less aggressibe LSO contains the globally unique identifier that identifies your computer for the web application that tracks you. What is Flash hardware acceleration and why to mention it? Hardware acceleration is when you have hardware designed to accelerate a specific function. So, for example, when you decode or encode video you do it on the CPU. Some video cards allow you to do this on their GPU instead, so you now have "hardware accelerated video decoding". (What does “hardware acceleration” refer to?). Flash hardware acceleration is a hardware acceleration for Flash (Performance or display issues with certain Flash videos). In most browsers this feature is disabled by default, but activating it to better visualize a given web Flash application exposes you to reveal more information about your hardware. But why to mention this? Because such information is stored in LSOs. So may my OS and hardware information be leaked out? And since it is possible to retrieve both OS and hardware information using the Capibilities class described in the first point, and a Flash web application may require, under your permission as you can read from the same last link, more than 100KB, and if the web application is nefarious the definite answer to your question is that it is likely, I mean possible, to happen especially with a misinformed user about security issues. Given these information, you may achieve what you asked (surely no one will tell you how) after digging deeper. But remember: if you want to do that in the purpose of evading brwoser fingerprinting then better forget the idea and use traditional methods. Edit flash with Privacy Manager from Ivan Iovation. I am the owner. You can set Flash to read your custom data. Not the answer you're looking for? Browse other questions tagged privacy firefox browser-extensions flash fingerprinting or ask your own question. How to fake a browser fingerprint? Is there a way to find out what information website queries about us?